BACKTOFRANKBLACK.COM: Exclusive! Lance Henriksen to publish autobiography! Exclusive! Lance Henriksen to publish autobiography! Lance Henriksen with the help of Nightmare in Red White and Blue writer/producer Joe Maddrey, will be publishing an autobiography of the actor's iconic life and career. Revealed exclusively on the Millennial Group Sessions podcast for BacktoFrankBlack, Lance Henriksen and Joe Maddrey gave some details on the project - which has been ongoing for 6 months. Lance was happy to give us a few details. "It [the book] really relates to the ability of Joe Maddrey to make form out of chaos, because my way of approaching it is of course like an actor so I babble on and on and on and try to get the stories out - and then he puts into a form that people can read [laughs]." When asked what it's like working with Lance on the autobiography, Joe told BacktoFrankBlack: "He is a natural storyteller... I don't know how many hours of recorded conversation we have had, but I promise you, there is not a boring story in there... he knows what to key in on when telling stories..!" To hear the interview in full, click here. 5 Responses to "Exclusive! 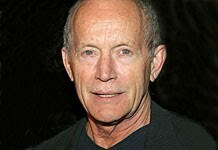 Lance Henriksen to publish autobiography!" Great news. I cannot wait for this book. Indeed, this is wonderful news. Lance Henriksen's biography will undoubtedly prove to be one hell of a read! Plus, we'll undoubtedly be granted the opportunity to learn more about Frank Black as a character--from the man himself! I'll be the first in line to pick up a copy. THIS IS A GOLDEN OPPORTUNITY! Can´t wait to read it! Time to open a POBox number in USA lol! Really can't wait to read this. Lance always comes across as such a fascinating and wise human being, so it will be intriguing to gain a further insight into his life journey to this point. And, as Dixon notes, likewise to learn more about his experience inhabiting Frank Black in Millennium! I am very, very, very, very excited to read this!!!! I personally love all the great stories I hear about Lance before stardom and would like to get some official word on that. Plus, I am a junkie for production drama and insider info on my favorite movies (i.e. Aliens, Near Dark, etc). I just beg Mr. Lance Henriksen to make the title a really good one. Seriously. . .sometimes a celebrities biography title can turn people off from a book entirely. My nominee from the worst is Melissa Gilbert's 'Prairie Tale' *slaps head*. Rutger Hauer ruined it for me by naming his book All Those Moments and putting it in Blade Runner font!